Tymr is a FUN and EASY way to schedule COOL, LOVING and IMPORTANT messages or images for your FRIENDS, LOVED ONES and BUSINESS ASSOCIATES via email, WhatsApp, SMS or Facebook Messenger. Brought to you by Spreebie, Inc, Tymr is a utilitarian response to the need that people have to get their reminders combined with messaging – a way to make sure that a communication faux pas never happens (either in you personal life or in business). 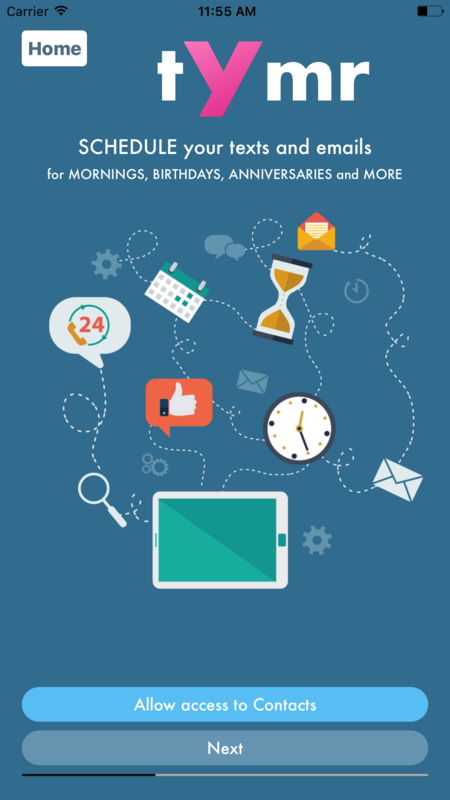 NEVER FORGET to send an ANNIVERSARY, BIRTHDAY or IMPORTANT business message again. You can store all the important messages you want to send beforehand and then schedule those messages to be sent, with your approval, at any future date. Business relationship management is also VERY important. Keep in touch with everyone in your network by sending them steady messages to makes sure you are always on their minds. Think up a message for someone who is important to you and schedule it for an opportune time because timing REALLY matters. Tymr is a GREAT way to show people you care about that they are ALWAYS on your mind. SCHEDULE TEXTS and IMAGES – schedule messages for your WhatsApp, email and SMS contacts or cool images for your Facebook Messenger contacts. REMINDERS – Get reminded about important dates – you can record tasks for a future time. When the task is due, it changes color and opens a dialog in the app. NOTES – take notes of important thoughts that you can compose into messages later on. NOTIFICATIONS – get notifications when messages are due to be sent. All you do is open the app and you will be guided to complete sending the already compose messages.